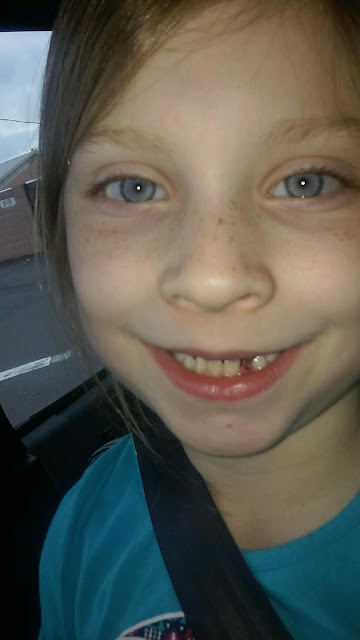 Our girl lost her 3rd tooth yesterday morning while she and daddy were at daily mass together. They wrapped it in tin foil from the parish kitchen to keep it secure. They called me at work to share the news. Once home, they popped the little packet into her tooth fairy pillow. Aaaand ... the tooth fairy got caught up in watching Doc Martin with her honey and FORGOT TO PAY THE KID. Jorde called me today to tell me of our oopsie. Thankfully, The Girl wasn't upset. She theorized that maybe the tooth fairy couldn't see her tooth through the foil, and it should have been wrapped in tissue like we have done for her previous losses. So, we switched out the wrapping before bed. It worked! The TF saw her tooth! ... or the alarm on her cell reminded her ... or the call from her hubs reminded her ... Anyhoo, the girl got paid. Making childhood magical is hard work.